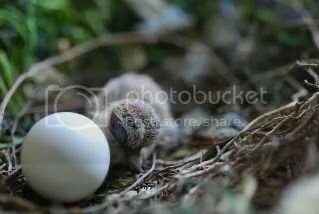 This morning, I was getting up and I heard the mama bird outside and went to the window to see what was going on. She was perched on the edge of her nest with an almost whole egg in her mouth. She glanced at me and flew away. A little while later, I started hearing cheeping sounds and I asked Matt if he could hear them. He said he couldn’t, so he decided to go out for a smoke to check it out. Not wanting to miss out on the action, I rushed around getting my camera. We went outside and she was sitting on the nest, which made me worried and then she got angry and flew away. I knew it was going to happen but couldn’t resist seeing a newborn. And there it was! So teeny, sitting next to its sibling who’s still unhatched. The eggs had been laid a couple of days apart. So I took a couple of photos. Got the one I wanted and left the area so she could come back (with a little bit of Matt prodding me to go back inside). So, now as I’m sitting writing this, the window in front of me looks out on the back yard. I can see a bird shooting back and forth. As she goes out of my sight, I’m pretty sure it’s her. Possibly, though, it’s the male bird that we haven’t seen much of but apparently should exist. Here’s a photo of the baby, less than an hour old. That is SO cool! and a beautiful picture too.